Happy Holi-doze is Handcrafted - Dated 1996 - Sculpted by Dill Rhodus. QX5904. 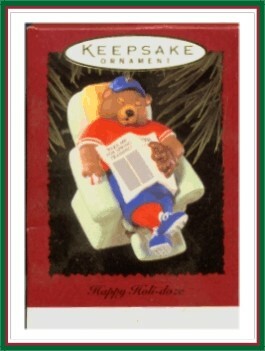 This bear thinks that winter is one super reason to doze off and dream of the next baseball season! (Wonder why Hallmark only choose baseball instead of football, basketball, or the returning hockey season?) Anyway, how many people do you know that fall asleep with the remote control in their hands? MIB with normal box aging and dents on sides of box. Has Price Tag. Has never been displayed. Cute Hallmark Keepsake Ornament.